Your many ailments are due to wrong breathing habit!! No, you didn’t read wrong. Wrong breathing habit, is more common then we like to believe. And it’s mostly undetected. So, let’s analyse, what is this wrong breathing habit being referred to here? Now, observe how you did it!! What did you actually do? Did you inhale as long as possible, while lifting the chest area(in some case even shoulders), filling in your lungs? If little more aware, you must have sat straight (if not already) while doing so. After this breath, did you focus on exhaling also? or your breath just got released? By any chance, were you sitting straight? If you didn’t exhale with awareness too, or you were not sitting straight, then this is what is called wrong breathing pattern. 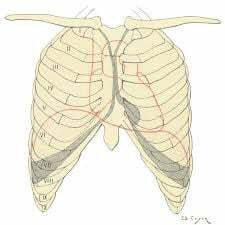 As you can see from the image above, our rib cage and by the extension, our lungs are narrow at top and broad at the bottom. Means, maximum air can be accommodated in lower part of lungs only. And our ribs are basically bones, Bones cannot expand. So when we think that by lifting our chest we are expanding the chest area, it is only on the surface. That means, our lungs have to expand to fill in the air. The only direction they can expand is down, towards the lower area of our rib cage. Now, this is possible only when we are sitting straight, or nearly straight. So that, the upper area of our abdomen can move along with lower chest area, to breathe deeply. Sit straight (you can use your chair’s backrest to guide your posture). Without moving your shoulders, use your upper abdomen area to take a gentle deep breath. Observe the difference. It helps in carbon dioxide out of the body. It helps in creating enough space to take next deep breath. [ I will explain this concept is more detail in the separate post about yogic breathing]. You can also read how yoga works on body-2? Thus, with each breath, in yogic understanding, exhalation is as important as inhalation. But, this is something that is ignored over time. Which leads to less than optimal inhalation and thus subsequent, less breathing efficiency with each breath. Add this step, whenever you inhale deeply, focus on exhaling deeply too. You will wonder how your next breath will change and feel more effective. How can wrong breathing effect health? So, we know what is wrong breathing, how to correct it with simple steps. But the main question remains, how does it affect our health? Our breath is what drives nourishment in our body. With each breath, about quarter of it is used by our brain. Rest is what is used by our body. Our body works on basis of priority. Means, high priority body organs are nourished first, followed by others. So, imagine, living in a city, working in a sedentary job, travelling to and fro to work place. There is less of fresh air in city. This coupled with wrong breathing habit, leads to low level of breathing. Doing this over span of few years, leads to several body organs getting less nourishment of oxygenated blood. With lack of body movements due to lack of time and commitment, they are weakened further. This vicious cycle leads to a weakened immune system, which leads to lifestyle-related ailments. This is an oversimplified version of the whole process, but this how it more or less happens. We have been breathing all our life. Even when, due to changes in our working conditions and lifestyle, we have developed wrong breathing patterns, it can be reversed. To learn how to breathe properly, using the correct breathing technique of how to breathe from the diaphragm, is not difficult at all. The good part is, the human body is capable of healing itself from most of the ailments, if it is provided with proper exercise and rest. And, these don’t need to be a very elaborate program. You can start by correcting your posture 3-4 times a day and observe your breath, using the technique mentioned above. From there you can practice more deeply by reading about deep belly breathing and yogic breathing technique in this post. Few simple stretches on regular basis, followed by mindful breathing is all that it takes to regain health. *If you like this post, please share your comments in the comment section below.